NEWS (JUNE 2017): Boon or bane? PHOTO BY GEREMY BORDONARO/GLEANER NEWS: Attendees at the third public consultation on the Bloor Street Pilot Bike Lanes annotated a map with comments on the pilot project. The annotations devolved into a war of words, in which one resident found himself battling another over the viability of businesses and bikes. When it comes to bike lanes, business owners along Bloor Street West are evenly split: about half support them, and about half don’t. It’s a rift between business owners who think the lanes are a boon and those who think they are a bane. At the heart of the debate is whether or not the bikes have had a positive impact on sales. One of the street’s shop owners who is definitely in favour of the lanes is Brent Robinson from Sweet Pete’s Bike Shop. But for other shops, the opposite is true, as in the case of Risque Clothing, which owns two shops on Bloor Street West. 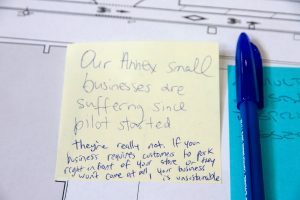 While quite a few business owners say they have been negatively impacted by the bike lanes, many are reluctant to speak out against them for fear of retaliation. “I feel like some of my customers would try to murder me if I said anything against them,” said Miranda Black, owner and manager of Theodore 1922. That’s where the Toronto Centre for Active Transportation (TCAT) comes in. An advocacy group that works to make streets more inclusive for walking and cycling, TCAT is conducting an economic study aimed at finding and addressing the concerns of business owners. A comprehensive survey of consumers and merchant owners along Bloor Street, it will compare statistics from before and after the bike lanes were installed to assess whether there has been any change in the area. Cressy hopes the study will lead to a good outcome for all the parties involved.